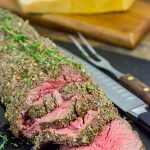 This Beef Tenderloin with Parmesan Butter is a delicious and surprisingly easy recipe to make! This is perfect for a special occasion...or any day that ends in -y! Using a small bowl, combine oregano, thyme, rosemary, salt, pepper and mustard powder. Rub spice mixture evenly over entire tenderloin. Place tenderloin on rack of a small roasting pan. Reduce oven temperature to 325°F. Continue roasting for 60 minutes (for medium doneness), or until internal temperature reaches 135°-140°F. Remove tenderloin from oven and tent lightly with foil. Let rest for 15 minutes. Meanwhile, make the parmesan butter by combining all ingredients in a small bowl. Brush this mixture on top of the roast.